Which licensing bundle do you need? How much does licensing cost? 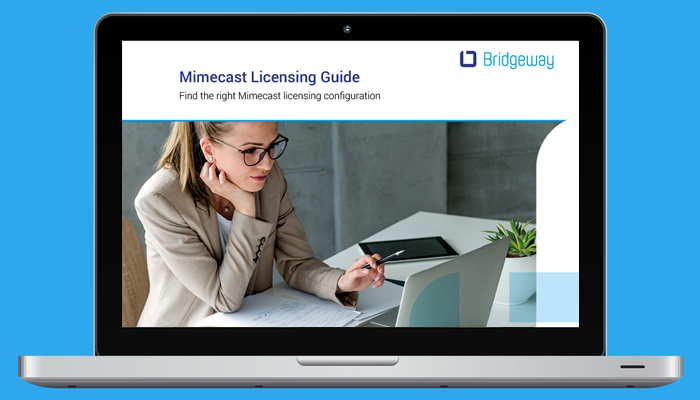 Which Mimecast licensing bundle do you need? The five main feature packages provide a comprehensive level of email security (including targeted threat protection), compliance and data loss protection, continuity cover in the case of a loss of email service, and the further option of email archiving. Mimecast also has a web security service to complement the email packages. Considering Mimecast for your business? 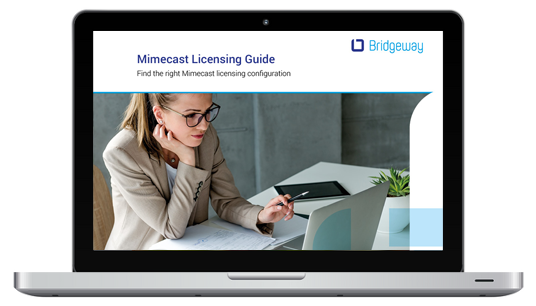 Download the Mimecast Licensing Guide and find the right configuration for your business. How much does Mimecast licensing cost? Licences can be purchased on a per user basis. Note there is no minimum requirement of licences but volume breakpoints can save up to 13% at each breakpoint. Please contact us for the latest information on volume breakpoints. Bridgeway has a proven pedigree in saving Mimecast customers money and ensuring project success. If you are unsure as to which licence choice is best for your needs, please contact us for some free and impartial advice. With Mimecast's expert awareness training, our organisation’s vulnerability to human error by combining effective, modern training techniques with predictive analytics. We know that even your best employees can be careless and resistant to change. Their casual mistakes can lead to disaster all the time — and the cost can be staggering. Maclay Murray & Spens LLP (MMS) update their network and security infrastructure to better protect sensitive data against threats, maintain customer confidence, and enhance productivity. Read this case study to find out how Mimecast's cloud email security, continuity, archiving and management solution replaced MMS’s previous on-premise email archiving, freeing up server space and boosting productivity. A mobility problem shared is a mobility problem halved. If you are considering (or re-considering) a Mobile IT project and you’d like to discuss your challenges, hear how your peers are overcoming them, and network with a like-minded group of IT professionals managing mobility projects, then you should attend our next free Mobile IT User Forum event in Glasgow. Join us for interactive discussions, customer use cases, and vendor roadmaps. We’ll speak about the products, policies, processes, and people core to executing a mobile IT project efficiently and successfully. The upcoming event is in May. We’d love to see you there and help you move your Mobile IT project from tactical to strategic. Register now and take your Mobile IT project to the next level! Join IT security professionals for interactive discussions, customer use cases and vendor roadmaps. We’ll look at the products, policies, processes and people core to executing a Mobile IT project efficiently and successfully . This free event will allow you to connect with your peers and a number of Mobile IT experts, learn and share best practices, and obtain hands-on experience with new Mobile IT solutions.